If you missed the last Full Moon Jazz Concert, be sure to add this to your calendar now! 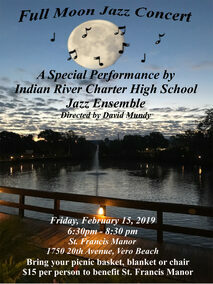 On February 15, 2019, join St. Francis Manor and The Indian River County Charter High School Jazz Ensemble for an evening under the February full moon. Bring your picnic basket and chair or blanket to St. Francis Manor and enjoy an evening of Jazz by these talented young artists. For info call 772-562-8575. For more information on the Indian River Charter High School Jazz Ensemble visit https://irchs.org.